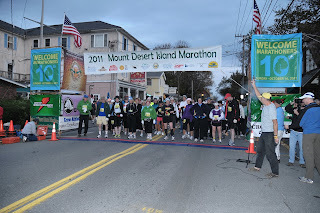 I loved the Mount Desert Island Marathon. I also disliked the Mount Desert Island Marathon, but simply because I wasn't in prime shape to run a race that had a vertical gain of 17 billion feet (that may be a slight exaggeration). I wasn't even in prime shape to run a race that was dead flat and there was little enough of that. I don't often go into marathons thinking that this will be my very first DNF. For 4 weeks following the Fox Cities Marathon I had no confidence that I could finish this one. My plantar plate didn't magically heal itself, my cyst didn't magically disappear. Also, between the races I gained a few pounds and my asthma acted up. Almost as if my brain was trying to give my body a reason to sit down in the middle of the race and quit. Well, I ignored that and soldiered on. Saturday morning there was an optional free fun run (with a $10 breakfast afterward, should you chose to stay). We decided Friday night that we'd all walk this, just to get our legs freshened up from the traveling the day before. Sis, Tracy and I met Sandy downtown at the start. The race club handed out special bib numbers for all the runners and after a few words, we were off! Or rather, they were off and we started walking. Everyone else was running and out of sight within minutes. The route was less than 2 miles, to the Atlantic Oceanside (where the expo was being held). It was a lovely morning for a walk and it was very nice to spend time with Sandy. We hung around at the hotel so we could go to the expo when it opened. There was more than we were expecting. Packet pick-up went very quickly. The race shirt was a green quarter-zip wind shirt with the race logo on the front. This was a nice change from a typical tech or cotton tee. The expo also had a few booths selling merchandise, including one that had everything -- and I do mean everything -- that you could need to pick up for last minute race prep. 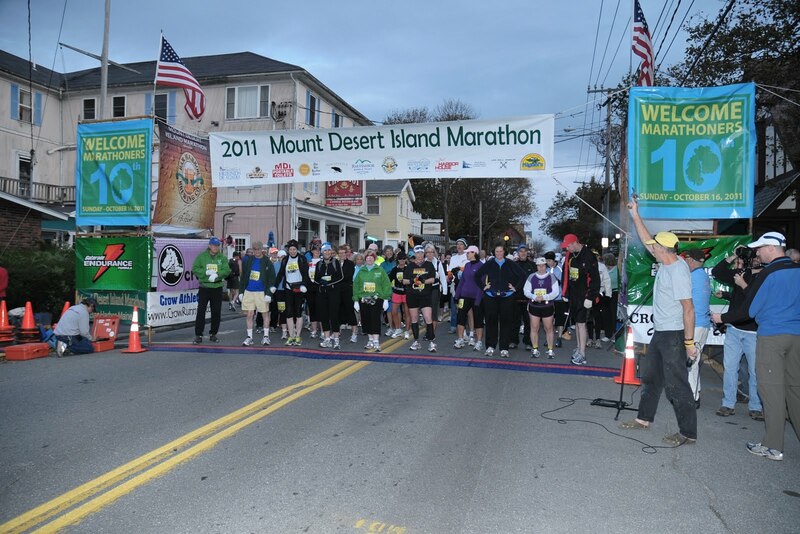 MDI offers an early start option for walkers and slow runners who think they'll take over 6 hours. Since all of my marathons this year have been 6+, I opted for that one extra hour. So did oodles of other people. There were well over 100 of us out there waiting for the sunrise and the gun. Being back-of-the-packers we all kept moving -- well, back. Nobody wanted to stand on the line. We're used to letting the quicker people go ahead of us. Yes, most of us would rather not have people jostling us aside because we're in their way. The race director finally said "This is YOUR START" before any of us moved forward. Since this seemed like my only chance, I stood right at that start line. You go first. No, you go first. No, I insist. You go first. The gun went off, and so did we. Relatively slowly, but still. I'm proud to say I led that race. For at least 3 minutes I was the leader on the road. Then someone running about an 11:30 mile passed me. My time in the sun was over (figuratively; it was overcast). Also, that's when the first hill started and I slowed down. My plan, such as it was, was to run as much as I could since running hurt my foot less than walking. But I also knew that my asthma wasn't going to let me run many of the uphills. I intended to run the flats (I don't think there were any flats), the downhills (there were a couple throughout the day) and the slight inclines, then walk the steeper hills. That actually worked well for a while. The weather was great, except for the very strong head-wind. It was cool-ish, overcast with short periods of sun. But that cold wind off the water, smack in the face, made running up all those bazillion hills even harder. Luckily the spectacular scenery more than made up for any wind and hills. Otherwise I do think I would have just sat down and pouted for a few hours until someone came to get me. Seriously, the sheer beauty of the Bar Harbor to Southwest Harbor route cannot be understated. To me, Big Sur International Marathon had all other races beat for scenery, but now I can say it has a rival. Despite my west coast bias I think the 2 races tie for utter beauty. I've seen the BSIM route several times, both during the races and in a car, and spent a lot of time on the MDI route (and drove it both before and after the race) and I think everyone who can should run both of these and make their own decision. I couldn't; I loved them both. But back to the race. My foot started getting a hot spot very early on and I had seen in previous races that the hot spot turned into pain quickly. I made it to about mile 8 before it hurt and by the halfway point it really hurt. Running hurt, walking hurt more. With the wind in my face I couldn't run as much as I'd like so I just slogged on. There were aid stations about every 2 or 2-1/2 miles. They were well staffed with very cheerful friendly volunteers, even during our early start. There was water and some sort of -ade and I'm pretty sure that later stations had fruit also. One station at about mile 17 had gu. Because of the narrow roads and lack of alternative routes around the race, there weren't many spectators except at official spectator spots (there were about 8 of those). There wasn't much traffic until we got to mile 20-ish and then the road got very busy. We were really confined to the road shoulder then and the condition of those shoulders was poor. This was where the 5 hour runners were passing the 6 hour runners so it got crowded. Still, everyone remained polite. I love small races! Miles 20-25 were uphill, some of it just a middling grade and some of it real hill. It was one road, going in one direction, and I tried to studiously stare at the scenery and ignore how craptastic I was feeling. I was walking as much as running at that point. Mile 25 is the "Top of the Hill" and supposedly it's all downhill from there. Uh, not quite. I'd say it was more downhill-ish, with a couple of uphill grades along the way. Also, the road got very narrow and crowded with all the earlier finishers driving away. For about a half mile we were confined to a sidewalk-path-thing; very narrow with broken asphalt and curbs. Since my agility had departed some 4 hours earlier I wasn't sure I'd make the last half mile without breaking something. But make it I did, even beating 6:30. Barely. My dear sister and brother-in-law, along with Sandy and her husband, cheered for me as I attempted a finish line sprint. This was my slowest of all marathons but at least I wasn't sitting somewhere on the road by Somes Sound crying my eyes out. I got my medal and my space blanket and waited for my cheerleaders to find me. I was pooped and not about to go looking for them. I had given my all, what little "my all" entailed, and was glad it was behind me. There was a tent with food for the finishers. Ice cream! Pumpkin and blueberry! Without spoons. I grabbed some of that and told my sis that if she could find a spoon I'd share with her. My very resourceful, ice cream loving sis did indeed find a spoon and I realized that ice cream wasn't what I wanted so I passed her the entire cup. I went back in the tent and saw there were bagels, some with cream cheese and some with peanut butter. I wanted a combination that wasn't pre-spread so the nice volunteer cut a fresh bagel and smeared it for me. There were also lots of little bags of chips (cheese doodles! ), baskets of candy, an energy drink and I think other drinks. Somewhere I think there was a beer tent but I never went looking. I had worn my Marathon Maniac short-sleeve shirt for the race and received many comments both during and after. Every Maniac who passed me (which was most of them) gave me a "good job, Maniac" or "looking good, Maniac." Many people asked about criteria for joining and I think this race probably added to our numbers. It was fun wearing a conversation starter. The weather was perfect for wearing a black shirt, shorts, calf sleeves and my buffs. I pulled the buff over my face a couple of times when the wind got high. I also had gloves which I took off after a couple of hours and tucked into my belt in case it got windy later. I was wearing a MM cap and was initially afraid that it would blow off in the wind. I managed to keep my head tucked during any gusts and it stayed on. Probably because for most of the race my sunglasses were up on my head too. I'm glad I did this race. I wish I could say I ran this marathon but that's inaccurate; I ran part of this marathon and just pushed forward for the rest. It was a great experience and a wonderful vacation. Maybe I'll write about that next. Have you ever been to Maine? Do you prefer the East Coast over the West Coast (or are you just happy to see any coast at all)? Have you ever run a race with 17 billion feet of vertical gain? Let me know! It's a bear in a lobster suit! How cute is this? ?